(REUTERS) - Manchester City's squad will be boosted by the return from injury of forward Sergio Aguero and midfielder Jack Rodwell against Fulham in the Premier League on Saturday. Argentina international Aguero, the champions' top scorer last season, has been sidelined since the start of this month with a hamstring problem while Rodwell has been out for three months with a similar issue. "Sergio is OK. Jack is OK and Samir (Nasri is available) after suspension. Only now we are missing (defenders) Micah (Richards) and Maicon," said manager Roberto Mancini. He is also relieved to have captain Vincent Kompany available after the FA overturned the red card the central defender was shown in last weekend's 2-0 win at Arsenal. "I am very pleased because I think it is correct," the Italian said. "The referee managed the game very well but that situation he didn't see well because from his position he thought it was a red card. That tackle was not a red card." 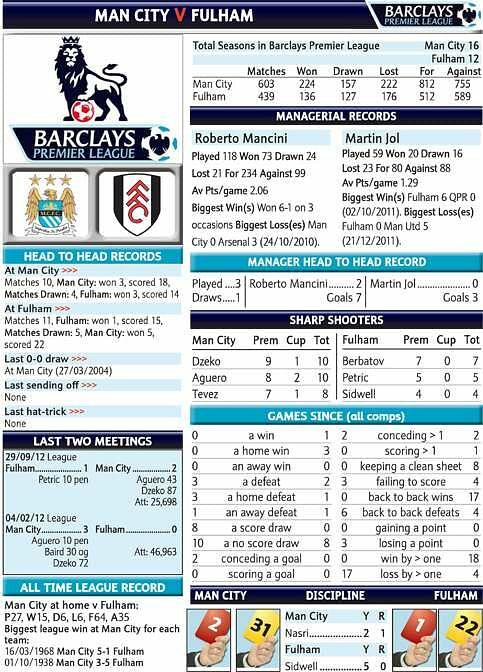 Saturday's game at home to mid-table Fulham presents City with a chance to provisionally narrow the seven-point gap on leaders Manchester United, who do not play at Tottenham Hotspur until the following day. City, who have 48 points from 22 games, look unlikely to try to boost their chances of retaining the title by adding any big-name signings in this month's transfer window. "In January it is difficult to take good players," Mancini said. "There is no one club that can sell good players in January. "Maybe we can find young players. If we have this chance in the next 10-12 days, probably we can do something but I am not sure."